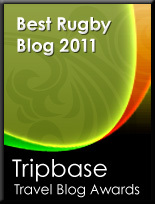 TOTAL FLANKER...a rugby blog: Strike! "...I propose that a mass demonstration to the ELV is staged on September 13th 2008, the 1st or 2nd weekend of grass roots rugby that will be affected. I want, referees, players, spectators, volunteers at all levels to stay away in London, England, Wales, Scotland, Britain, France, Italy; wherever..."
Check out Big Dai's blog for more.